Last night in a spontaneous and random status update on Facebook, I announced that I had a ridiculous amount of holy cards stuck everywhere. I was astounded by the response. Evidently there needs to be a 12-step program for holy card hoarders, huh? Whatever. I’m not breaking the habit any time soon, so forgetaboutit. They are everywhere, as bookmarks, little reminders, spontaneous little signs of joy, and reminders to pray. Still, it does amuse me to find them in totally random places. Like the other day, I was looking for some sunglasses in those nifty hideaway tiny compartments in my husband’s good ol’ boy pick-up truck and when I popped the little door the Divine Mercy prayer card fell out. His distress was palpable…”put that back please,” he said, like I was gonna help myself to it. Oh. Well. I must have a reputation for doing that, then. Oops. Perhaps that explains why today, after yesterday’s cleaning session and discovery of all things holy cards, I found a new stash…this one just fell out of a journal that I’m not even using. We can talk about my collection of empty journals another time. Dang, I wish I could’ve seen the convo for your FB status update! (Gave up playin’ in FB and other soc. med. sites for Lent, but am still following pals’ blogs via my feed reader.) I have to admit, I’m as bad as you, though I’d never thought of having holy cards tucked away in the car, like John! Great idea! Oh, and I’m so bad, that I even bought these spiffy holy-card stands … and need to order more! We have a huge holy card collection—lots as bookmarkers, little piles next to the books, random places, the car, and a container in a drawer for the all the rest. That’s where we keep the free rosaries from all the Catholic fundraisers. 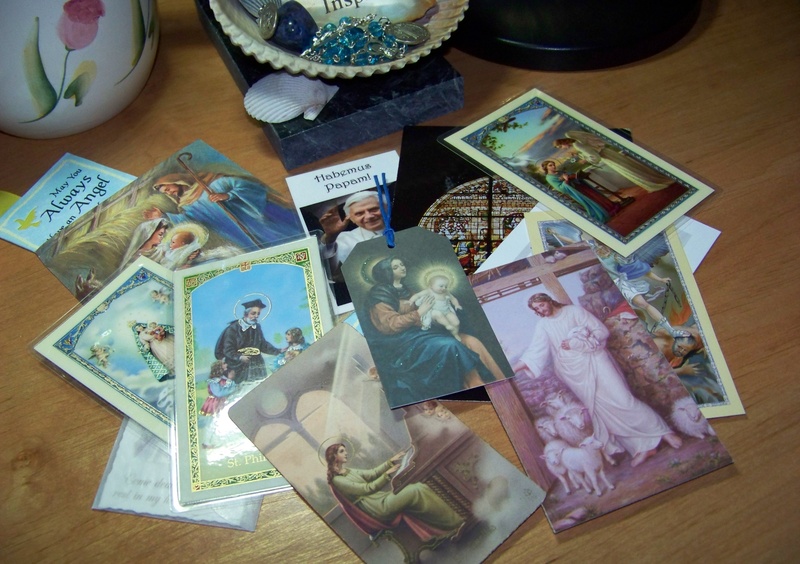 I wish I had all the cards the nuns and the 4 great uncles of mine who were priests (RIP) gave me when I was a kid. I did find one which I believe I put in a small frame, although i can’t recall now where I put it. I grab them now when i can. Sad to say I don’t keep holy cards, but I do have a number of half filled journals with very mundane things in them. I carry two rosaries, a five way scapular, and wear a crucifix and a brown scapular every where I go.